A strikingly clean and attractive design. 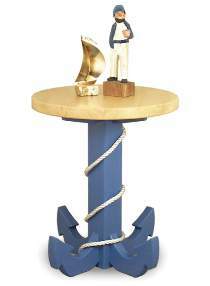 The perfect accent to use with our other nautical furniture projects. Use as an end table, a side table, or to display plants. Build it from standard 3/4" and 1-1/2" lumber. Measures 24"H. All patterns are drawn FULL SIZE.